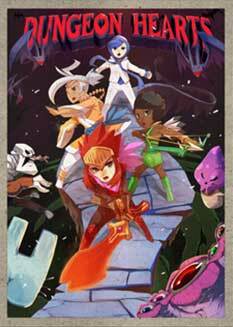 Dungeon Hearts fuses the strategy and pattern matching of puzzle games with the kinetic pace of action games. Puzzle/RPG Hybrid – Quickly align runes within the rapid match-three puzzle system to wield devastating attacks, defend against enemy offensives, and unleash multi-hero combos. The Fatestream – Plan your strategy under pressure with dozens of different runes linked to each hero and defend against powerful attacks and dreaded hexes cast by enemies against your heroes. Four Unique Heroes – Balance the individual skills of each hero and level them up to unlock and unleash a dozen different special powers for new attacks, healing magic, and time-altering spells. Limitless Adventure – Face a randomly generated battle sequence with every new adventure and battle against a bestiary of over 40 creatures and 7 bosses lurking around ten unique environments. Brimming with Secrets – Each defeated enemy reveals a sliver of the world's lore and the heroes' history. A Vibrant Soundscape – Unlock 4 bonus soundtracks, each in a different musical genre.